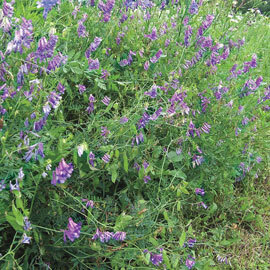 If your soil isn't producing the way it used to, it's time to introduce it to a cover crop! Cover crops fortify your soil with the minerals it's lost over time, improving tilth and introducing plenty of organic material and beneficial microorganisms back into the soil. 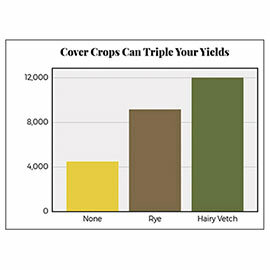 Cover crops also help to reduce erosion and can even prevent weeds! Hairy Vetch is great for reintroducing nitrogen to the soil for plants that need lots of it, like roses, tomatoes, corn, cucumbers and squash. It grows tall and dense, with small trumpet-shaped, purple flowers. Use a hand broadcaster to sow 2 lbs per 1,000 square feet of soil. Germination: 10 - 14 days. Ideal temperature for germination is about 68 degrees F. If the soil temperature is too cold, the seed will not germinate. Plant vetch 30 to 45 days before killing frost for winter annual management. Soil Preference: Till soil so that after seed is sown, seed can be raked into the top 1/4" of finely worked soil. (A leaf rake works better for this purpose than a garden rake, but either will do.) Watering will hasten germination.